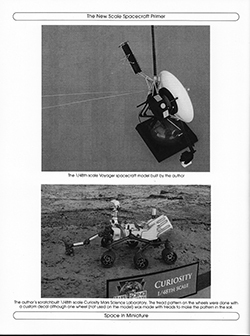 Michael Mackowski has been publishing the Space in Miniature series, books which deal with scale modeling of historical spacecraft, since 1990. 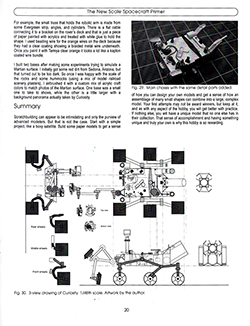 The original publication, SIM #1 - A Scale Spacecraft Primer, has long been out of date. This new publication corrects that. 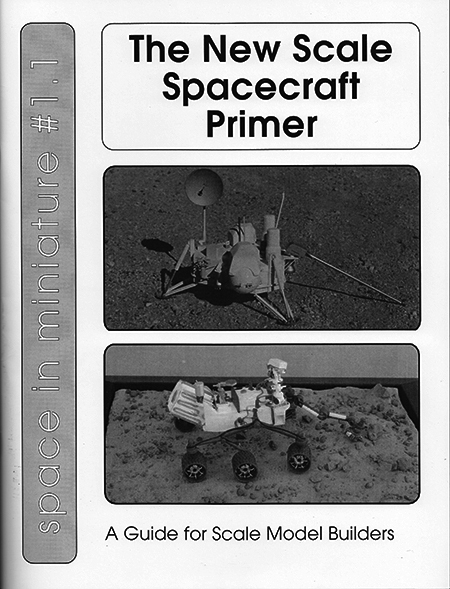 SIM #1.1 - A New Scale Spacecraft Primer is a completely revised publication, with 2/3 of the content being new to the book (including reprints of articles originally published in the IPMS Journal). To acknowledge the 25th anniversary of Space in Miniature (and the 50th anniversary of IPMS/USA, several retrospective articles are included, including commentary by Kevin Atkins, Sven Knudson and Mat Irvine. An Introduction to Real Space Modeling - general notes on scratchbuilding, correcting and detailing kits, sources of information, and an overview of the book by the author. Judging Guide for Space and Science Fiction - guidelines for modelers who want to enter their work in scale modeling contests. Guest Commentaries - perspectives on the hobby from Kevin Atkins, Sven Knudson and Mat Irvine. Examples of Scratchbuilding - Overviews of various scratchbuily models by the author, including Ranger, Surveyor probes, Viking and Luna 9 landers, and the Curiosity rover. Cardstock Modeling - A brief overview, with useful links, of paper/card modeling. 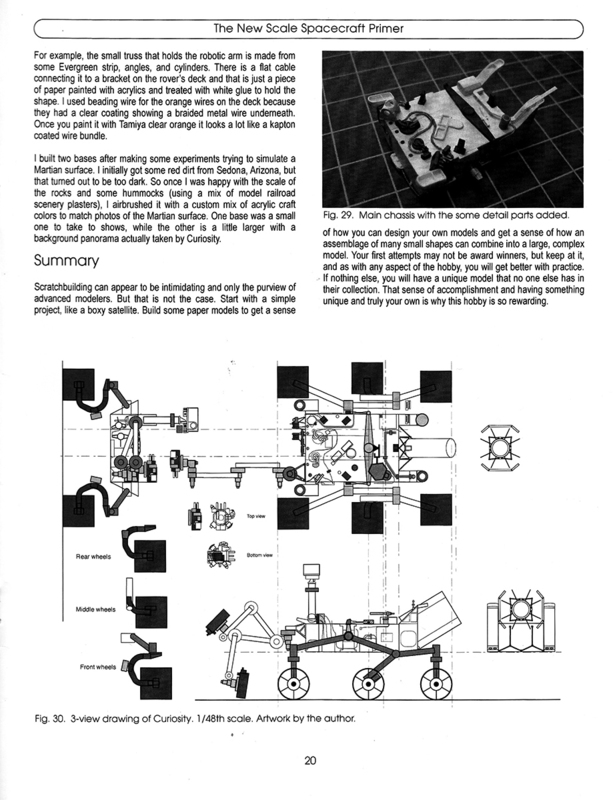 Accurizing Revell's Astronaut with MMU - How the author corrected Revell's kit. Landsat 4 and Solar Max - Scratchbuilding these satellites. Includes scale plans in 1/72. The Ariane Rocket - A detailed look at available Ariane rocket kits by Mike Idacavage, with a build guide for the Revell 1/144 Ariane 4 by Joe Suszynski. Delta Clipper - Experimental - A look at scratchbuilding McDonnell-Douglas' experimental reusable rocket, with 1/72 scale drawings. Orbital's L-1011 and Pegasus - A look at how to build Orbital Sciences Corporation's air-launched space delivery vehicle and its L-1011 "mothership". Includes scale drawings. X-30 - Converting Aurora's Ragnark Orbital Interceptor into the conceptual X-30 orbital spaceplane. Includes diagrams. Kit Reviews - Reviews of the Revell 1/144 Space Operations Center, Wave Space Settlement, and Hasegawa Unmanned Space Probe Voyager. SIM #1.1 is a good general introduction to scale spacecraft modeling. The various articles are clearly written and easy to follow. Diagrams and plans are well-drawn and clearly labelled. As befits a "primer", most of the articles are relatively short and general. The plans, references and links contained in this book are valuable to those interested in delving deeper into the genre. Many thanks to Space In Miniature for providing the review samples. Manufacturers and retailers, interested in getting your wares reviewed and publicized on a site averaging 6000+ readers a day? Contact us! This page copyright © 2015 Starship Modeler. First posted on 28 August 2015.